THE PERFECT BUNDLE TO CLEANSE AND DETOX, ANYTIME OF YEAR. The Food Matters Cleanse & Detox Pack will guide you on a gentle, easy-to-do cleanse and provide plenty of inspiration to help you continue to eat well and nourish your body way beyond your annual detox. The 3-day detox is the same one we do every year as a whole body reset, and we love the results! Plus you’ll discover the eye opening reality of what the standard Western diet is doing to our bodies, and the simple solutions to help your body heal itself naturally. Get ready to radiate health from the inside out! 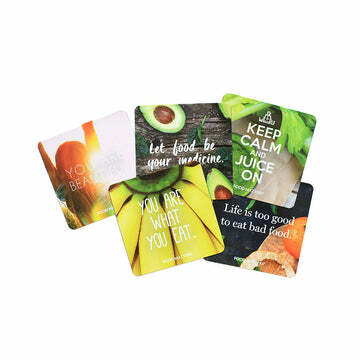 5 beautiful inspirational magnets for your fridge door, so every time you open it you think twice about your food choices! The Juices, Smoothies & Soups with Medicinal Powers Recipe Book is your perfect companion to learn all about how to guide yourself through gentle cleansing. With over 100 pages of pre-cleansing education, cleansing recipes to follow and post-cleansing information, tips and recipes.